Today I am going to be doing a First Impression blog, but instead of a product that I will be testing out, this is actually going to be food related! So if you are a foodie like myself, join me as I do a taste test with Chomps Snack Sticks! From the time I was a little kid I enjoyed beef jerky snack sticks. However many that are on the market today just aren't that good for you. They are packed with by products, fillers, preservatives and who knows what else. When I had the chance to connect with Chomps Snack Sticks I really liked how they made their product. 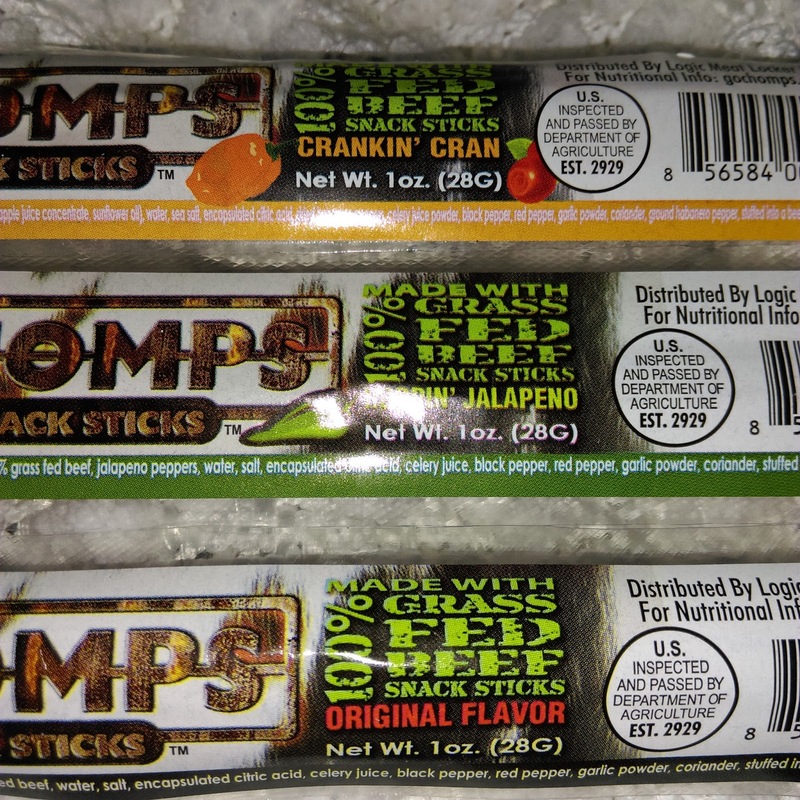 The Chomps Snack Sticks are made with 100% grass fed beef, no MSG, nitrates, fillers, binders, and no added preservatives. They instead use celery juice to keep the beef sticks staying fresh. Amazing right? I loved that I could read the ingredients label, and see just a few simple ingredients. Chomps Snack Sticks sent me their 3 flavors to sample. Original, Hoppin' Jalapeno, and Crankin' Cran. I just finished sampling each, so let me share my thoughts! Original Flavor- I absolutely love these! I will say that out of all 3 flavors this was my favorite. It has a nice beef jerky snack stick flavor to it that we are all familiar with. The flavors are nice and bold, without being spicy. I love that these snack sticks aren't greasy or oily as some others can be. These are a perfect snack, and are great for on the go. 100 calories per stick which is fantastic for those who are calorie counting. Hoppin' Jalapeno- This flavor has a nice little kick to it. I personally am not a fan of spicy foods, and this one wasn't too bad. It has a lovely jalapeno flavor, with that kick. I really enjoyed this flavor, and it is one that I would have again! This also is just 100 calories per stick! Crankin' Cran- This one was just a little too spicy for me. It starts off with a sweet flavor, then the heat kicks in. For me I had to grab a glass of milk to put out the fire in my mouth! It definitely has some heat and some kick! However if you are someone who loves spicy foods, this would be one I would really recommend trying. It really just comes down to your own preferences. This one comes in at 110 calories which is still fantastic! I really enjoyed these snack sticks! I have 1 stick left in each flavor that I will be giving as samples to family members over the Christmas holiday coming up, and I'm eager to hear their thoughts! For me, I really give Chomps Snack Sticks a big 2 thumbs up. I love how basic they keep their food, its something I appreciate. I would like to see more flavors from this company because they obviously are on the right track with these snack sticks! Perhaps a teriyaki flavor? For those on special diets, these have no added sugars, are gluten free and are paleo friendly! 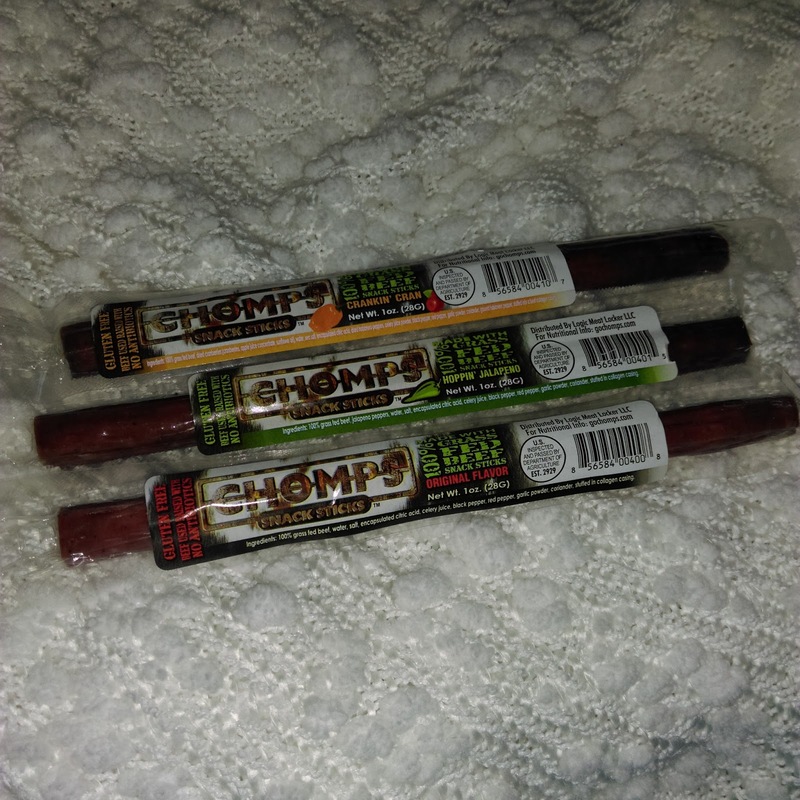 If you want to try out these snacks for yourself, you can visit their online website, Chomps Snack Sticks. Also enter the giveaway Chomps Snacks Sticks is holding below!